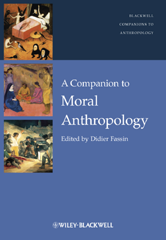 A Companion to Moral Anthropology is the first collective consideration of the anthropological dimensions of morals, morality, and ethics. Original essays by international experts explore the various currents, approaches, and issues in this important new discipline, examining topics such as the ethnography of moralities, the study of moral subjectivities, and the exploration of moral economies. Represents the first collection to provide a broad picture of a new field of research, moral anthropology, that includes the ethnography of moralities, the study of moral subjectivities and the exploration of moral economies. Investigates the central legacies of moral anthropology, the formation of moral facts and values, the context of local moralities, and the frontiers between moralities, politics, humanitarianism. Features contributions from pioneers in the field of moral anthropology, as well as international experts in related fields such as moral philosophy, moral psychology, evolutionary biology and neuroethics.